Although Chopin spent most of his adult life Paris, his roots were Polish. In homage to his homeland, he developed two genres of music, the polonaise and the mazurka. The mazurka takes much of its form from the native folk songs and dances of Poland, specifically the Mazur, the Kujawiak, and the Oberek. The unusual rhythmic patterns and irregular accents provided the basis for 57 mazurkas in total, each unique in character and texture. Because of the different sources of inspiration for the mazurka, each piece is a different combination of several ingredients of rhythm, harmony, tempo, and mood. This particular genre, more than any other, encouraged Chopin to revise and experiment freely. 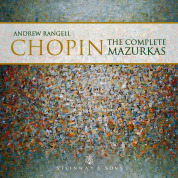 Unlike many of his other mazurkas collections, the pieces of Op. 59 do not contrast greatly amongst themselves. They share similar characteristics and textures, perhaps meant to unify the collection. The first piece in the set is highly chromatic, warm and rich in melodic and contrapuntal nuances. It serves as a tender portrait, the ending as unassuming as the opening. Pleasant and good-natured in its character, the second mazurka features a rich exchange between hands, a hallmark of Chopin's mature style. This piece ends with an ascending, winding lyrical line, which seems to disappear into the clouds. Resembling a polonaise, the third composition is noble and waltz-like in character. Having experimented with different contrapuntal devices, Chopin includes chromaticism, as well as some interesting descending chromatic chords in the accompaniment. While much interesting harmonic material is found in the lower voices, this particular composition is defined by the unaffected, expressive singing melody appears to be unaffected, soaring above the texture below.